The events of June 11, 1982 have weighed on me since. The weight is not due to it having been the 473rd anniversary of Henry VIII’s marriage to Catherine of Aragon. More due to the union of Mr. T to Slyvester of Stallone. Although E.T. 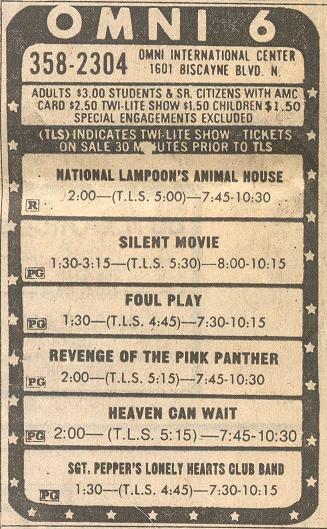 was released that day, I had made plans with a friend and co-worker at Southeast Bank to watch Rocky III at the nearby Omni 6 theater in the Omni International Mall. The Omni 6 [Omni 10 came later] was Miami’s first movie multiplex. The Mall also had the first major bookstores I had been to, a B. Dalton and Waldenbooks. But I only browsed at mall prices, my book dollars were spent at Raquel Roque’s independent bookstore, the Downtown Book Center. We planned on catching the twi-lite show [a pattern had already emerged] and my friend was bringing his wife. A price-discounted Friday night movie was this then 23 year-old’s idea of a good way to start the weekend. The Metromover was still 5 years away, the Brickell/Omni loop 12 years away, so I drove over to the Omni early enough to make my usual browsing rounds of their bookstores. I then walked over to the theater to get my ticket and wait for my friend, Manny, and his wife. They missed our appointed time. First moral decision, wait and forgo the previews? I passed with flying colors. Mobile phones being 1 million years away, I could only wait. I checked with the theater staff on how long the previews lasted, they had no idea, but mustered up enough energy to agree with my 10 minute estimate. My internal deadline approached. Justifications raced through the mind. They had forgotten. They changed their minds, they instead went into see E.T. and I had just missed them. In the last minutes of waiting, I scoured the escalator like an inept spy in a B movie. Women began staring back clutching their purses. Me: I waited and you guys never showed. Manny: No, no. We ran late, but got there just as the movie started. We figured you were running late and decided to wait for you. After about 15 minutes of standing around her legs really started bothering her so we had to leave, but we were worried about you. Did I mention Manny’s wife was pregnant? How pregnant? David would be born 40 days later. On the 33rd anniversary, I still wander those lands [now the Miami International University School of Art & Design] seeking forgiveness. Mr T, ora pro nobis. This entry was posted in Entertainment and tagged E.T., Miami International University School of Art & Design, Mr. T, Omni 6 Theatres, Omni International Mall, Raquel Roque, Rocky III, Sylvester Stallone. Bookmark the permalink. I remember that day very well. Pregnant wife, hormones out of whack (her not me), swollen feet (me not her) as we searched for our friend and co-worker. I remember we searched all over the Omni mall. We even went to the ground floor where the giant carousal was, thinking that perhaps you went for a spin before the big movie, but no Jorge. 33 years later I too wonder about that day. Was it the cause of my divorce two years later? Is it the reason that no matter how many times I’ve seen the movie on television, I still get teary eyed knowing that Mickey will not live to see Rocky IV, V, and VI? Here is what I do know. The marriage did not last but our friendship has. All is forgiven my friend. BTW what are you doing November of this year? “Creed” the movie opens (http://www.imdb.com/title/tt3076658/). Don’t know about twilight show prices, but I’m sure they will have a senior citizen discount. How to refuse a package of redemption and a movie. But if you don’t mind, can we drive over together? I’m thinking Mary may even insist.